I like this web site very much, Its a real nice billet to read and find info . "Reason is not measured by size or height, but by principle." by Epictetus. Yes, there are a lot of chipmunks this year. Not sure exlcaty why, but they tend to go through boom bust cycles, as to many small mammals. Perhaps the deep layer of snow was good insulation to allow more to survive the winter, perhaps abundant fall food allowed for good caches for the winter. There might be a corresponding bumper crop of some raptors. Alright, Let us be on our way then. NASA is one of the few gov agencys that have paid off hansomely ...and yet it seems to be like pulling teeth to get them the funding they need. Considering they found ice on the side of the moon not visible from earth back in 1996, which was confirmed to be water by satellite, this isn't really much of a discovery. Why go to the moon? We get all of the cheese we need from Wisconsin. Maybe it's just waste water, from the secret alien moon base..Oh that is on the other side of the moon though..
Aren't these BOGUS searches for water by NASA so convenient? Just when NASA has a big budget cut and has to cancel its water-finding MARS missions, it suddenly "uncovers" water on the MOON. Hocus pocus and needless waste of our resources. 12 miles in diameter and two miles deep! That is just hard to imagine. I love stuff like this. Legend says that the astronauts were told not to return to the moon by it's inhabitants. Living on the moon a few months at a time would be cool. In others words an OK place to visit but I wouldn't want to live there. With surface temperatures around 150 Fahrenheit at moon noon and -150 before dawn a stroll around the rim of the crater would always be dangerous not to mention you have to carry your own air. There's no point in exploring the resources on moons and planets for the sake of terraforming and making them habitable. We can't even manage to terraform and save Planet Earth. If we don't force the fossil fuel companies to retool for clean energy, Earth is going to look like the moon in a century. That is comical that you think humans have the power to impact the earth to the point where we are going to cause CATASTROPHIC changes in 100 years. The earth was here long before humans and will be here long after as well. Forces of nature are far more powerful than anything humans can do. Humans are a force of nature. That's not true, we do impact the Earth on a daily basis. If you think that we can not change the behaviors of the atmosphere then set off a few Tzar bombs. As to the disagreements between the eco-friendly people and the people who don't believe in climate change, it seems that they are too extreme in either case. It's not all going to blow up tomorrow as the movie "Day after Tomorrow" would have you believe. It's not entirely impossible, but quite improbable. The thought that we don't affect the environment around us is just close minded. For every action, there is an equal and opposite reaction. God made the earth for us to use up. Once we've done that...He'll provide an alternative. The Passenger Pigeon? It went from a population of millions upon millions to extinction in just a couple decades because of over hunting. Don't be foolish and believe that humanity does not have harsh and swift negative impact on this world. It is NOT ridiculous that human activities, taken en masse, could significantly alter the planet. Furthermore, since there are only certain conditions in which the planet is even habitable for us, we might not need to significantly alter it. We only need to alter it in such a way as to make *our* lives on this planet precarious. What he is saying is that we can't create CATASTROPHIC changes in 100 years, if we get close to doing that the Earth will wipe us out and go back to the way it was before. I would have imagined that making the planet uninhabitable for humans counts as a catastrophic change. Even making populated *portions* of the planet uninhabitable would count. But maybe thats just me. There's no reason we can't do both. America managed to spend over several thousand billion dollars (a couple of trillion) on the wars in Iraq and Afghanistan. What has that accomplished? Had we spent that on clean energy research and space exploration, there still would have been a large sum left over. Money is not really the problem–it's allocating resources to what is most in the national interest. Amen! We weren't put here to see how many planets we can spoil. Great. So we use up all the moon water. What are the moon people gonna drink now? I believe there's water on Uranus. Those oceans are liquid methane. Looks like rainbow sherbert to me. now THAT would be a good find! If Newt gets the VP job, maybe he can still go ahead with 13,000 people on the moon. They will need water in the size of several Olympic sized swimming pools to be able to grow food, drink and to have their own gym and sports club. They will also need water to wash their pimped out moon buggies and to make slushies at the moon based convience stores. Some astronaut took a whiz in '69. The moon. Maybe a base to launch from but who would want to live there? Can't imagine the money it would cost to try and mine there. A pipe dream I think. 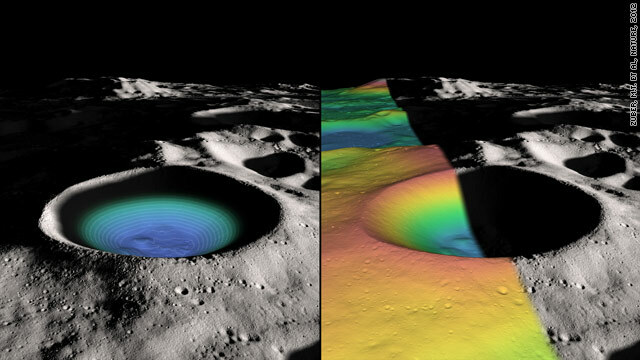 Come on NASA, use a "false color" other than BLUE, and it will no longer look like a pool of water in the bottom of that crater. Ever see "Idiocracy"? That's why we'll never go the moon. hmmm... so finally predictions in this video http://www.youtube.com/watch?v=npRste0fgAI are going to come true. I assume this is named for South Pole explorer Earnest Shackleton? If so, you've misspelled his name a few times at the beginning and in the caption. His biography "South: The Endurance Expedition" is gripping by the way. The government desperately want to colonize the moon so that the elite have a place to run when the nukes go off. ......and they can once and for all "truly" look down on the rest of us..
Nice catch - we missed a 'c' in there. It's been corrected. And yes, it is named for the South Pole explorer. Lets get there before the Chinese do. We've already been there...a long time ago! Not according to Faux News. So that why Newt Gingrich wanted to retire there! If things don't get fixed here on Earth soon we'll all be headed for the moon very soon. I'm sure what ever the reason we put people on the moon for an extended period of time is, it's going to cost a boat load of money I'm not sure I'd be willing to spend. If we cure cancer, poverty, hate, crime and lying politicians then maybe we can work on sending permanent residents to the moon. I agree with you. It is people like Queen Isabella that really should spend their money better. If we solve all those things there will be too many mouths to feed. Hah! Good luck with curing politicians of lying! Are you kidding? Colonizing the moon is way more realistic than ANY of those. There are people in this country with enough money to buy the moon outright. We've known this for about three years. This isn't news. Of course not. It's PR for NASA to get another round of funding for the wrong reasons. Hey, politicians! There's an extremely simple inorganic compound which is found all over the solar system on the moon! Give us money! This is about the most thrilling lunar discovery since we "discovered" that there were rocks on the moon. Pass the Tang. C'mon NASA. That ice is just where the lunar missions dumped their holding tanks. There's more than just that on the moon, don't forget the lunar ruins and the seven mile high tower with a cube on it that is all "secret". There's also a huge monolith on one of Mars's moons, Phobos, Buzz Aldrin has talked about this on C-SPAN. Bigfoot and Yeti are there too. There are hidden crops...with crop circles too. These findings are not recent at all. I remember my astronomy professor talking about this three years ago. He explained that if in fact this is frozen water it does not imply that it is being produced by the moon but simply generated by the atmosphere. So because of the atmosphere water molecules may have caused the concentration of what resulted in frozen water. Um. That might be difficult considering the moon has no atmosphere. Watch humans deplete a whole crater load of ice in five years (and that's probably being way too generous). The total of 100 gallons would only make for one, long, shower. Oh man- I hope it IS ice there! ....and I have ice cube in my freezer. Who cares!!?? Did you even bother to read the article? I mean actually take a minute or two and /read it/? Not just come on here and post "WHO CARES?". No? You don't really care "who cares" so why bother to ask who cares? Hold on tight, The Cheat — we're blastin' off TO THE MOOOOOOOON! I honestly thought we'd have some kind of moon base by now. As a young kid in the 60's it seemed like by 2012 things would be much different than they actually are. Less war, less hunger, a moon base, maybe even a base on Mars......oh well, I guess that is why kids dream and old people get cynical. Too many democrate in government! It was a "democrate" that commited us to lunar exploration in the first place, Einstein. Repubs are more interested in science for the purpose of killing, rather than for exploration. Too many republicans in government. Popeye, I thought the same thing when I was a kid in the early sixties. I am 56 now and I still hope I live to see at least a manned trip to Mars. Maybe it's just me, but I feel we lost a small sense of purpose in this country when we did not keep going to the Moon, and beyond. I know folks always say we can do this after we eliminate hunger, poverty, etc. As Jesus said, the Poor will always be with us. In the meantime I think it's important to feed the spirit with continuing exploration of the Solar System, at least. I'm afraid that 'a small sense of purpose' is all we ever had. We had a future then, but we spent the last 45 years breeding the poor. We got exactly what we paid for. The media still sells, and the public still buys, the same old snake oil. I always thought it mysterious why we gave up moon missions. It was the moon or wars – the last administration chose wars. Seriously....how do you know we don't have a moon base? I call first pool party on Shakleton crater. I was wondering when the 3rd sesoan of Emily of New Moon will be coming out on channel THIS TV. I've watched the 1st & 2nd sesoans twice already! I really want to see the next series, it's driving me nuts!!! !